Benedict-Ratzinger:  Take Your "Motu" Mess and Shove It! Copyright 2007 P. Anthony. Reproduction prohibited without authorization. Benedict-Ratzinger: Take Your "Motu" Mess and Shove It! With his Great "Motu" Mess Hoax, Benedict-Ratzinger has largely neutralized what had been the mounting opposition and hostility among the "indult"/conservative/semi-traditional crowd toward the Novus Ordo as the last years of the seemingly interminable reign of JPII wound down. It is becoming clear, as one sage traditional commentator predicted, that Benedict-Ratzinger will prove to be a far more effective instrument for Modernism than his Koran-kissing predecessor. 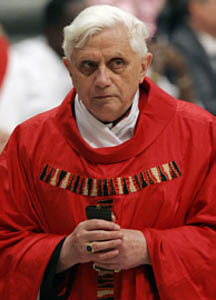 A typical example of "conservative" enthusiasm for the Motu Proprio Summorum pontificum can be seen in a Catholic World Report article: "What it signals is a welcome new era of liturgical seriousness and the beginning of the end to the demoralizing liturgical chaos and distortions of the last four decades.... Pope Benedict has performed a great service for the Church.... He deserves great praise for having the courage to address an act of self-mutilation which treated a long and fruitful liturgical tradition." Wrong! The Moto Proprio is not the beginning of a "restoration," as some gullible Newchurch "conservatives" believe, but instead is a textbook example of how Neo-Modernists (and make no mistake about it, Benedict-Ratzinger is one of these) have succeeded in maintaining their power. Thus, it is no longer a surprise how little the Conciliar popes have to do to elicit hosannas and Te Deums from the attention-starved "loyal opposition" in Newchurch. If Benedict-Ratzinger wanted a return to authentic Catholicism, there is no need to issue such nonsense as this Moto Proprio, but simply to reiterate Pope St. Pius V's dogmatic Bull Quo Primum, which guarantees in perpetuity the Roman Catholic Mass of Sts. Peter & Paul. Or, if Benedict-Ratzinger were truly sincere about Tradition, he could renounce the many errors contained in his own written works. Of course, he will take none of these actions. He will not even simulate (oh, maybe once for show) the 1962 Mass of "Blessed" John XXIII, which the Moto Proprio has supposedly "liberated." Some revolutionary! The Moto Proprio is a ploy intended to confuse and control "conservative" Newchurchers while it attempts to garner support for an institution that is arguably mired in the worst moral and doctrinal crisis of its existence -- a crisis brought about, in large measure, by the likes of Modernists like Benedict-Ratzinger. Praise of Benedict-Ratzinger will not, as naive "conservative" Newchurchers hope, spur greater traditional change, but will only prolong the Novus Ordo's existence. While Newchurch "conservatives" look to Newrome to bring about reform, traditional Catholics take the only approach that will ultimately succeed: the eradication of the Conciliar Church. Newchurch is not Catholic, but a false religion similar to the myriad of Protestant denominations that consider themselves to be "Christian." The New Order makes a mockery of the true Faith by offering in its temples an invalid and blasphemous Mess and spurious sacraments that are devoid of grace, administered by a presbyter and bishop caste not ordained and consecrated, but merely "installed" in non-Apostolic rites. No sane Catholic can have anything to do with such an abomination, but must do everything in his power to bring about its destruction. The only method by which to bring about this end is not through "negotiations," dialogue, or discussions (the policy that is favored by some clueless "conservative" organizations), but through a relentless assault until the New Order enemy is vanquished. Where the fate of souls is in the balance, no other approach will do. This is immemorial Catholic teaching. Such a task of true charity means persecution by the New Order, but traditional Catholics are used to that. Regimes like the New Order will not peacefully surrender. The most effective means to accomplish this noble mission is not to fawn when Newrome feints in a traditional direction, but through the establishment of more traditional Mass sites, the encouragement and support of traditional vocations, the formation of traditional seminaries and religious houses, the publication of traditional books and periodicals, the study of Latin, and the like. Each such traditional initiative brings the downfall of the New Order that much closer. Most importantly, however, traditional Catholics must rely on Almighty God and pray for the intercession of St. Michael. If the great warrior of God was able to banish Lucifer from the Holy Place, he should have little problem driving the Evil One's minions from their positions in Christ's once Holy Church.